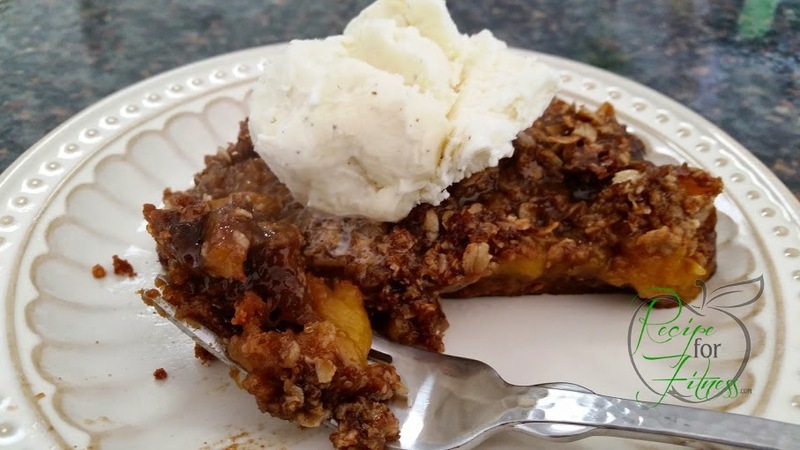 I've had my eye on several peach desserts lately... We love peach pie, but rarely do dessert, so I wanted to be sure whatever I came up with was awesome. ;-) And it was. Which was handy, as I was serving it to guests. Lol. I collected 30 recipes (that's actually the number I whittled it down to), and analyzed each one for the best features... crust, topping, filling, cooking method... Hours of research went into the development of this yummy treat - and in the end, you know what happened? I had to wing it. 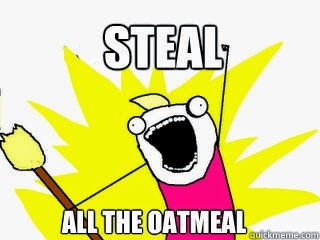 My container of old fashioned oats was missing. Totally MIA. Where the heck did it go??? By the way, still haven't found it. Weird. I had just been complaining to my hubby that the pantry was overflowing with food we don't eat - leftover from Shiloh's brief move back home while her hubby was deployed. 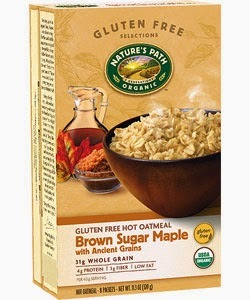 Well, boy was I glad I hadn't cleaned it out yet, because my pie was saved by 2 packets of her Maple & Brown Sugar Instant Oatmeal. Lol! Now, ya'll know me... I'm all about the natural, clean foods - so yes, the packets were clean (no junk in them), they're just not something anyone else but Shi eats. In building this recipe, one challenge I faced is that we just went out of peach season and I couldn't find fresh ones anywhere! I don't care for canned peaches (really, really don't care for the sugar they're packed in), so I went with frozen (single ingredient: peaches). Then, in my kitchen-genius, I decided to thaw them first. #fail. Don't try it. Bad idea. Bleh! Back to the store for more frozen peaches. Another challenge was that I wanted to keep this recipe "clean", but still stay true to the traditional peach treat - and NOT use any fancy ingredients that are a) hard to find, and b) expensive. Clean eating doesn't have to be pricey, and it sure as s**t doesn't have to be about fad ingredients. I ain't got time for that. ;-) So... while I do have a recipe to share, I also include tips for tweaks that can make it easier, cheaper, or just different. The cooking method... I really love my cast iron, so that's what I used. But, you can use a pie plate or pyrex baking dish if you prefer. The pie doesn't need any babysitting, so once it's in the oven, go enjoy a cup of coffee or whatnot, it'll be ready when the timer goes off. Easy peasy. Sweetener... there's a lot of different viewpoints on sweeteners in the clean eating lifestyle. Here's my perspective... the body treats sugar as sugar - no matter where it comes from, and sugar in the North American lifestyle is largely pure destruction. We eat way too much, in too many forms. That said, there is a place for it, in moderation, and with deliberation. I did not set out to make a "sugar free" pie because first, what's the point? and second - yuck. We can, and should, enjoy treats - just be mindful about it, and keep portions in check, then enjoy and savor each bite. All that said... I went with the following: brown sugar (real brown sugar, full of it's natural molasses, not white sugar with added molasses), honey (raw), and pure maple syrup. The amount used depends on the sweetness of the peaches. Because mine were frozen, they were a bit tart, so I adjusted my sweetener accordingly. Crust... 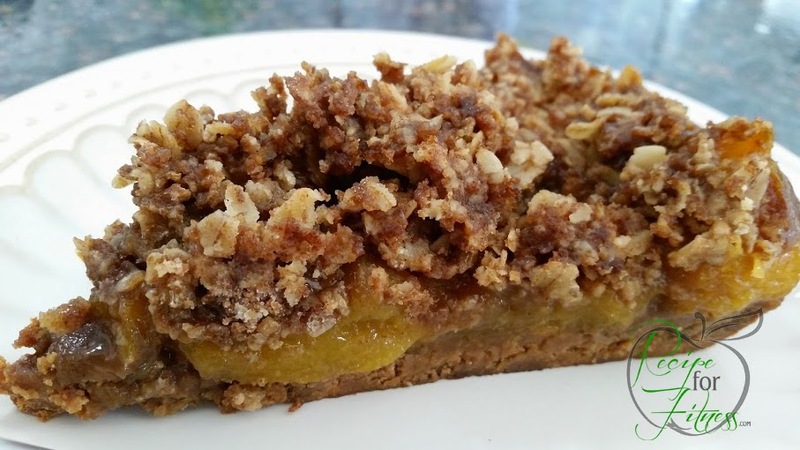 I wanted a bottom crust, and a thick, crunchy streusel topping, but I didn't want to use wheat. For the crust, I went with a blend of coconut flour and gluten-free gingersnaps, and for the streusel... well, that's where everything went sideways, lol. However, it all worked out pretty darn well. I reduced the brown sugar I'd planned to use, since the oatmeal already had some in it, and while the flavors worked great, I didn't get that beautiful streusel I wanted - no one cared but me, as it tasted phenomenal, but I'll give you directions both ways below. Fat... Pies are notorious for harboring fat. Butter, butter everywhere! Know what? I used butter. Yep. 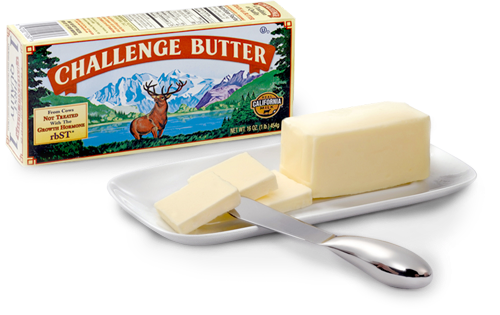 Real unsalted butter. I didn't use the multiple sticks of butter most recipes call for, but I used enough to get the results I needed. The other source of fat in the recipe is the coconut flour. We've talked about the fat from coconuts before - it's all good, plus hello-fiber! ;-) Fat does have a place in the clean eating lifestyle - again, it's about moderation and mindfulness. So... now that I've talked your ears off ;-) Let's make pie! 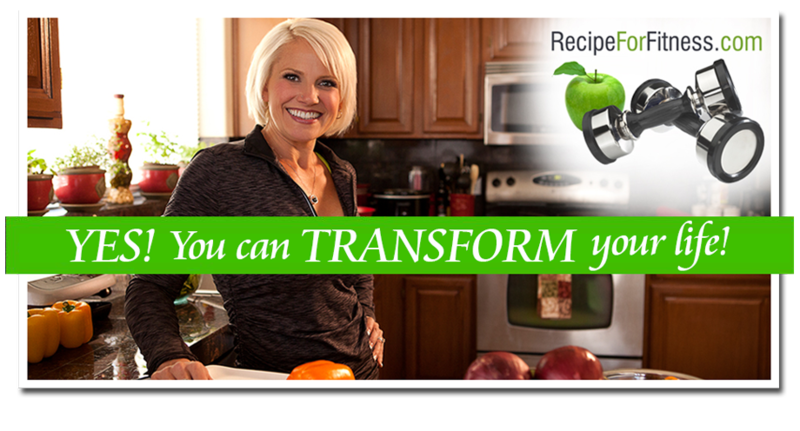 There's nothing like a hot bubbling piece of peach pie and this one delivers! Plus, no one will know it's gluten-free! In a large skillet or pot, melt 2 Tbsp butter over medium-high heat, add peaches and cook until softened. In a small bowl, combine cinnamon, nutmeg, cardamom and ginger. Set aside. In a food processor, blend gingersnaps until they resemble chunky flour. Add the coconut flour and mix well. Dice cold butter (5 Tbsp), and add to the food processor, then blend until butter is mostly incorporated and you can easily pinch off a ball of "dough" and squish it (I know, real technical, right? You want it to be able to squish down into the skillet/pie plate and hold shape, rather than be mostly crumb you can blow away). Spread crust batter into the bottom of a 10" cast iron skillet (or an 8x8 pyrex or pie plate). It will only cover the bottom and about 1/4 inch up the sides. Bake in oven 10-15 minutes or until crust is golden. Remove and set aside. 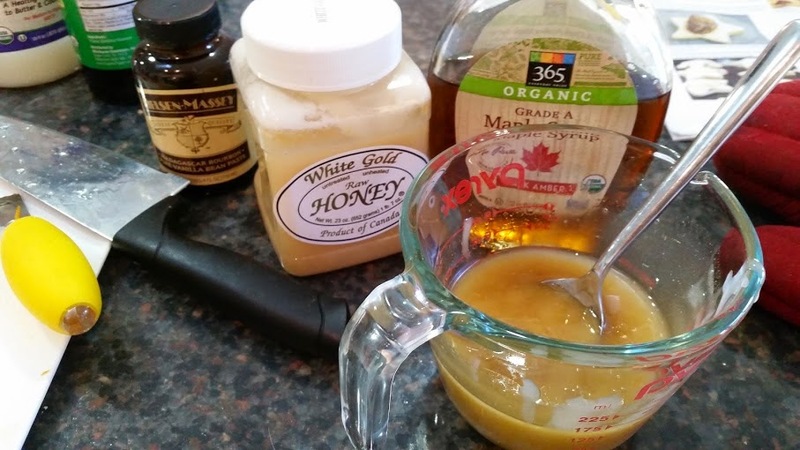 In a small bowl, combine honey, maple syrup, and vanilla, mixing until fully incorporated. Set aside. When peaches have reached desired softness (you should be able to cut them easily), remove from heat and add the bowl of sweetener, stirring to combine well. Add the spices, and mix well. Pour mixture on top of crust, spreading it out evenly. Sprinkle topping over the peaches. Bake at 350 for 30 minutes, until streusel is golden and peaches are bubbling. Remove to cool on hot pads or wire rack. Nutrition facts per serving: 439 calories | 3 grams protein | 65 grams carbs | 20 grams fat | 6 grams fiber | 43 grams. 71 mg.
You might also be interested in our other Dessert recipes.